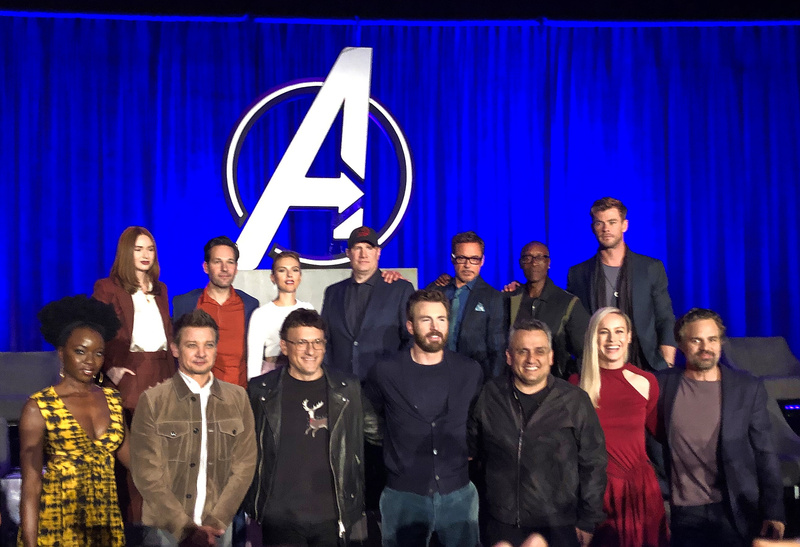 Less than a month before the release of the highly anticipated finale “Avengers: Endgame,” at least a hundred members of the press show up knowing little to nothing about how this next movie will play out. A booming announcer’s voice introduces our host: Jon Favreau, the director and producer of “Iron Man” and “The Avengers.” With a dramatic drop of the curtains, the cast that survived the devastating effects of Thanos’ snap is revealed: Paul Rudd, Brie Larson, Robert Downey Jr. Chris Evans, Jeremy Renner, Chris Hemsworth, Karen Gillan, Scarlett Johansson, Mark Ruffalo, Don Cheadle, Danai Gurira, along with Anthony and Joe Russo, and Kevin Feige, directors and executive producers of the film. After a recent footage screening, Marvel has revealed parts of the aftermath of the last film after a quick recap of the past 21 movies. Tony Stark (Robert Downey Jr.) and Nebula (Karen Gillan) are stranded out in space in a spaceship with only a single day of oxygen left. In a different clip, the remaining Avengers stay on Earth at their headquarters, joined by the most recent member of the MCU, Captain Marvel (Brie Larson). All in their worst states, the Avengers must figure out a way to overcome their loss and hardships to beat Thanos. “I came at just the most magical time at this 10 year anniversary. I had to stumble to figure out who my character was and perform for the first time in front of legends. It was incredible. The set, as big as it is, feels like a bunch of kids. There’s a sense of wonder and play and encouragement,” Larson said, emphasizing her impatience on the movie’s release so she could talk about her true reactions to the film. Anthony and Joe Russo came to present the footage to the audience, explaining that they were finishing the film that very day on April 5, adding touches to color in the animation studio directly across from the main theatre. It was an incredible moment to realize that we were only mere meters away from a complete, extravagant film. With the introduction of newer characters like Black Panther and Captain Marvel, the first Avenger, Captain America, discusses his reactions to a cross-over of leaders and like-minded people. Much of the cast refrains from revealing anything in the film, as they haven’t seen it yet. Paul Rudd jokingly says “I’ve seen the trailer so I know I’m in the film,” highlighting how much of the cast loves the relationships formed and the family made in an unreal sensation. “It’s a one-off — it will never happen again. I keep taking steps back trying to recognize this for what it is. It is so surreal to be a part of. It’s incredible to meet so many kids whose lives have been changed,” Rudd said. This movie stands as both the last large finale to a decade long film series and the beginning for many new Avengers, with a confirmed runtime of three hours and two minutes. “Avengers: Endgame” will be in theaters on April 26.